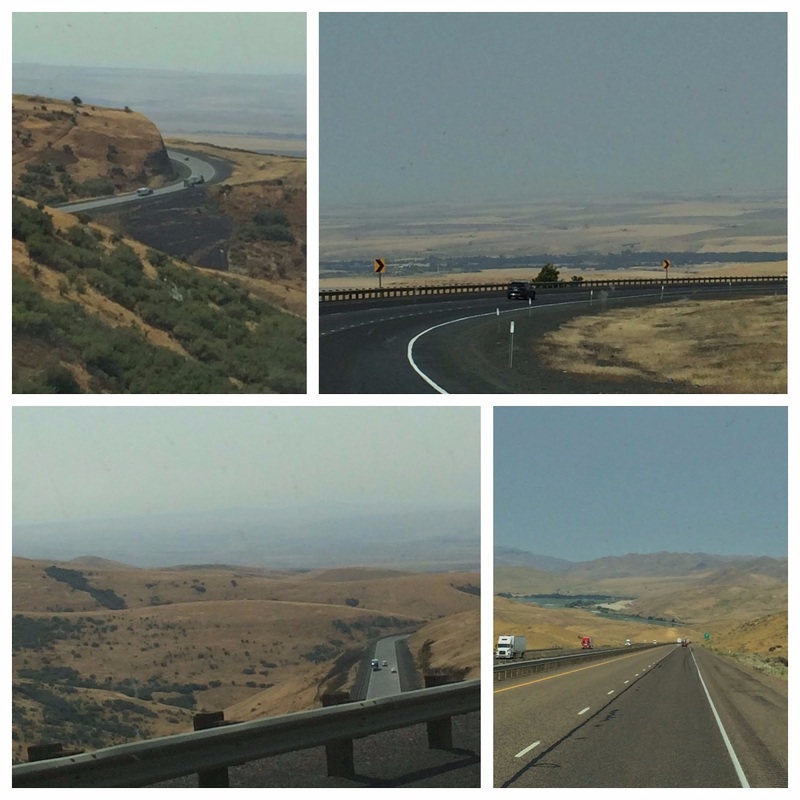 We said good-bye to Utah on August 20, 2017 and headed to Hagerman, ID. 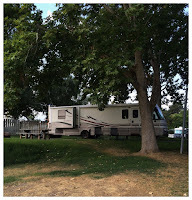 This was the second time we stayed at the Hagerman RV Village. The first time was back in September 2015. We were in Site 32, a gravel pull through with full hook ups, average width and a picnic table. 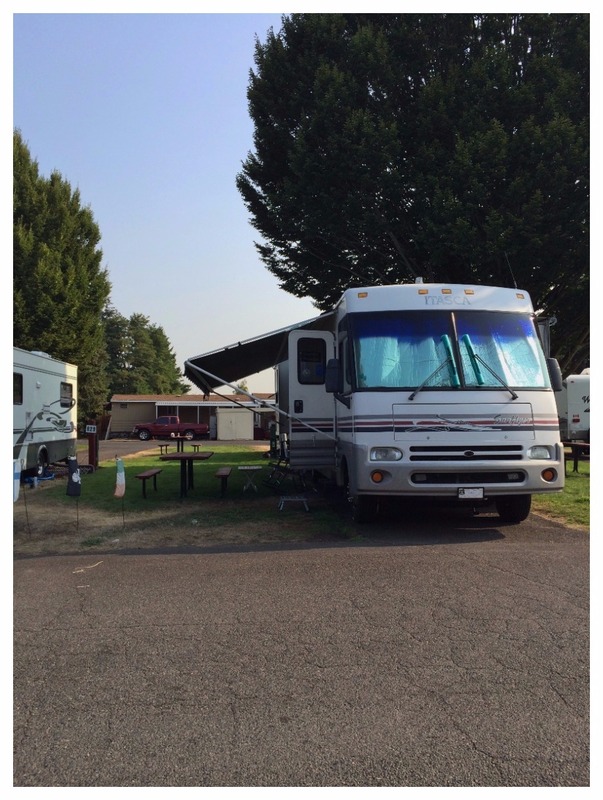 The park is well maintained, the laundry room and bathrooms are very clean. The rec room has a pool table, foosball, and exercise equipment. We paid $29.16 a night with our Good Sam discount. 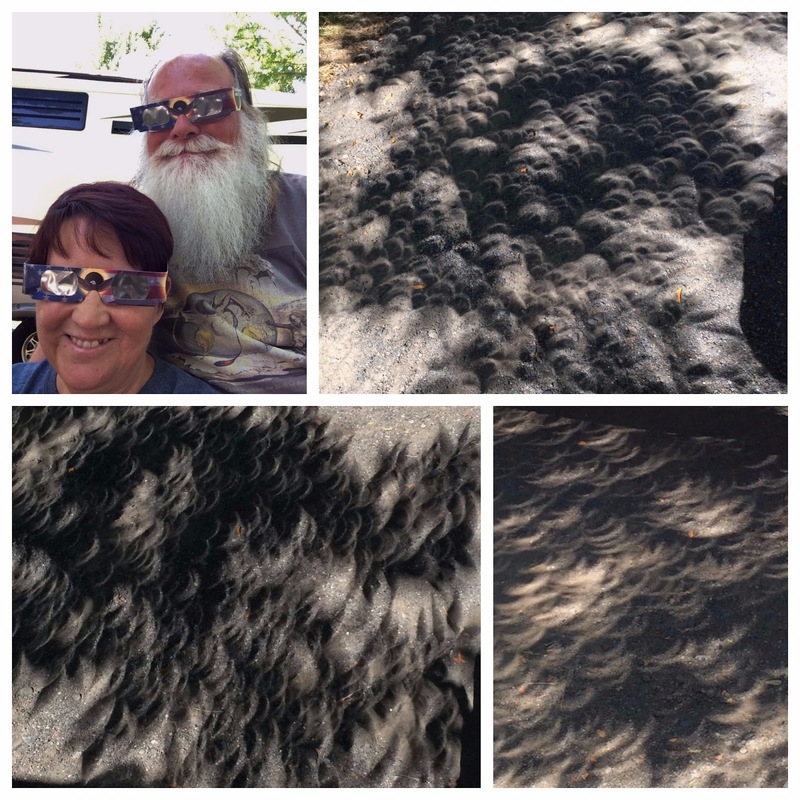 We were able to sit in front of the RV for the Solar Eclipse. We didn't have totality but we were at 97%. The changing shadows at various times through out the eclipse were so interesting to watch. 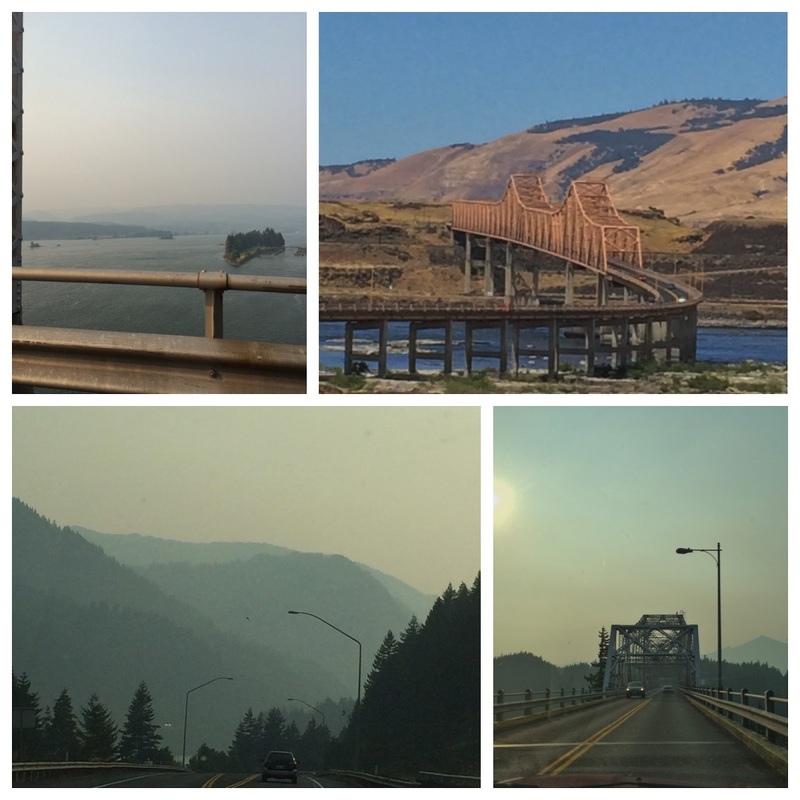 August 22, 2017 found us moving on to Boardmen, OR. It was a very long, 5+ hour drive. 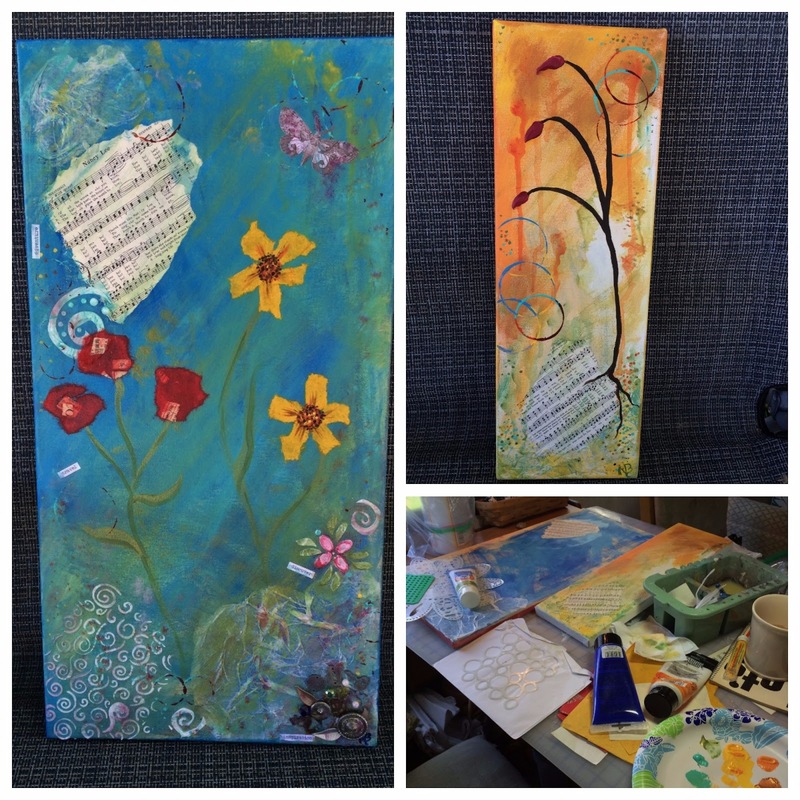 One stretch is through a hilly area, where you twist and turn. The views are pretty, but on this day the horizon was filled with smoke from fires in surrounding areas. 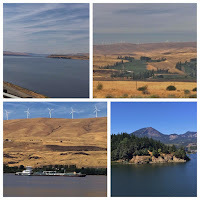 We stayed at the Boardmen Marina and RV Park, it is a city park and very well maintained and right on the Columbia River. The sites are very wide and most of them like ours are back-ins. We were in site 38, with full hook-ups and a picnic table. There is a paved walking/biking path that runs through the park. 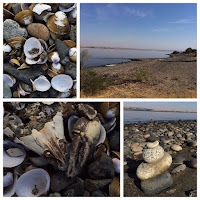 You have access to the river and a number of beaches. Perfect for morning dog walks. 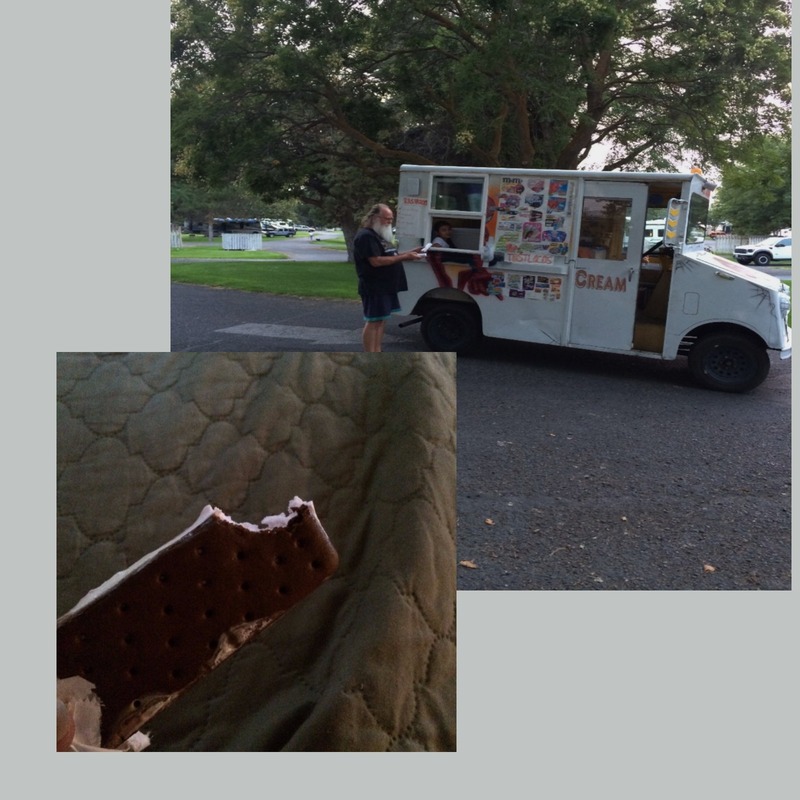 After the long drive and a few mishaps setting up, the sound of the ice cream truck was very welcomed. Nancy was like a 5 year old when she heard it. We got to share some stories with Michele Brinkert over a few beers at Ordnance Brewery. Kitt Mahaffy, Michele's dad, and Nancy grew up together and Michele and Katrina grew up together. We get to see her again after our trip to Alaska. 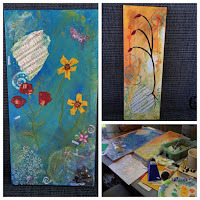 Nancy got a much needed art day and created two new mixed media pieces to brighten up our home. 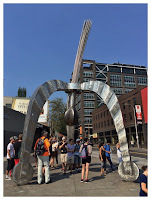 On August 25, 2017 we headed to Portland. 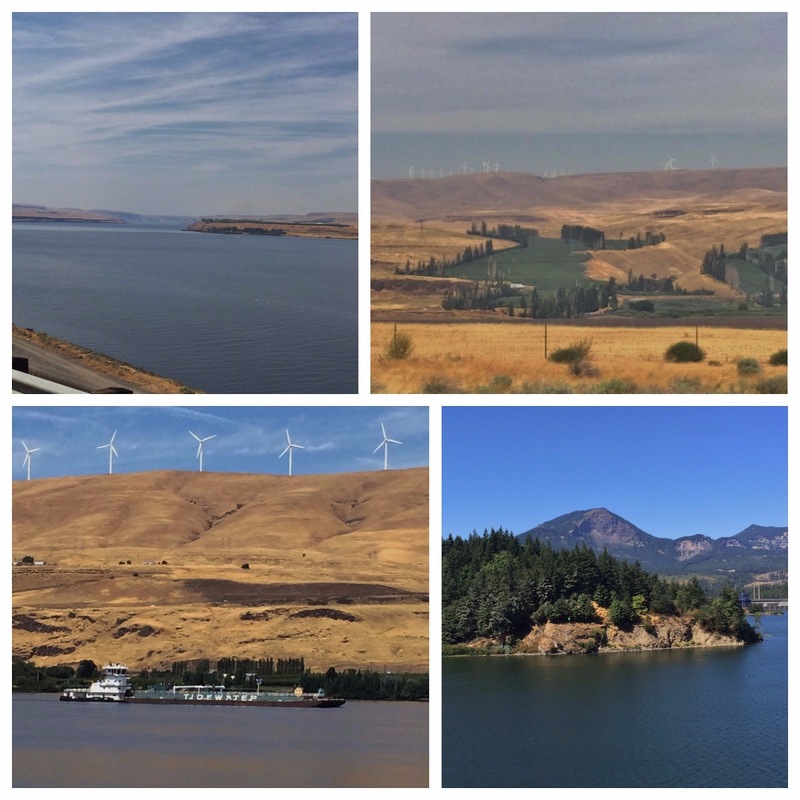 The drive here was so pretty, following the Columbia River all the way. We went from the brown grass and sagebrush to beautiful greens. 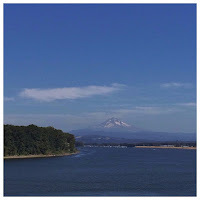 We passed a couple of dams on the way, saw some tugboats and barges, plus lots of fishing boats and Mt. Hood off in the distance. 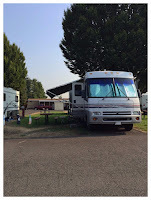 Jantzen Beach RV Park was home for a week. 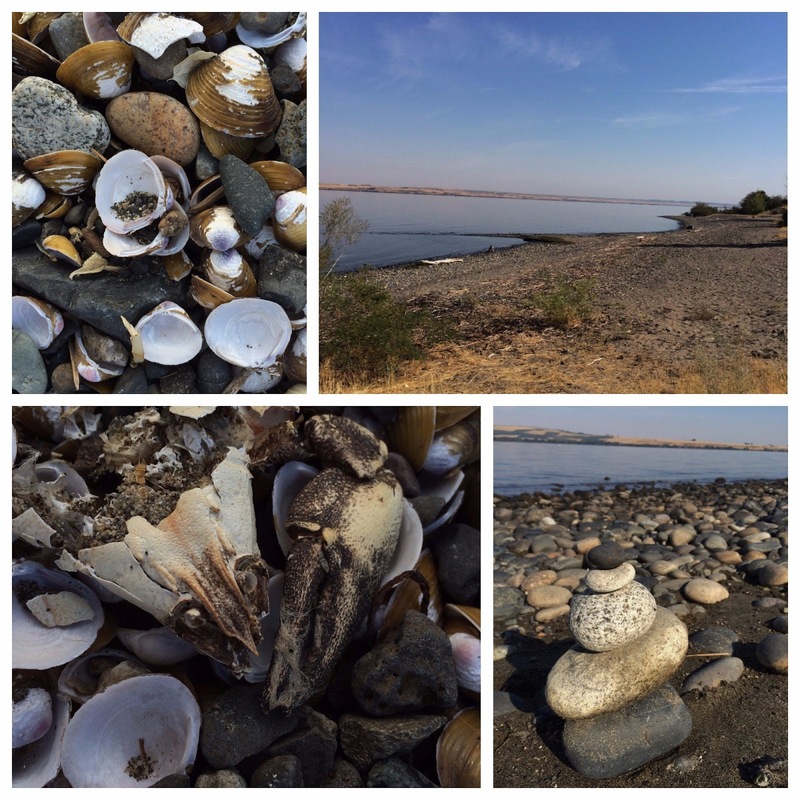 While we were on an island in the Columbia River, don't let the name fool you, there is no beach. 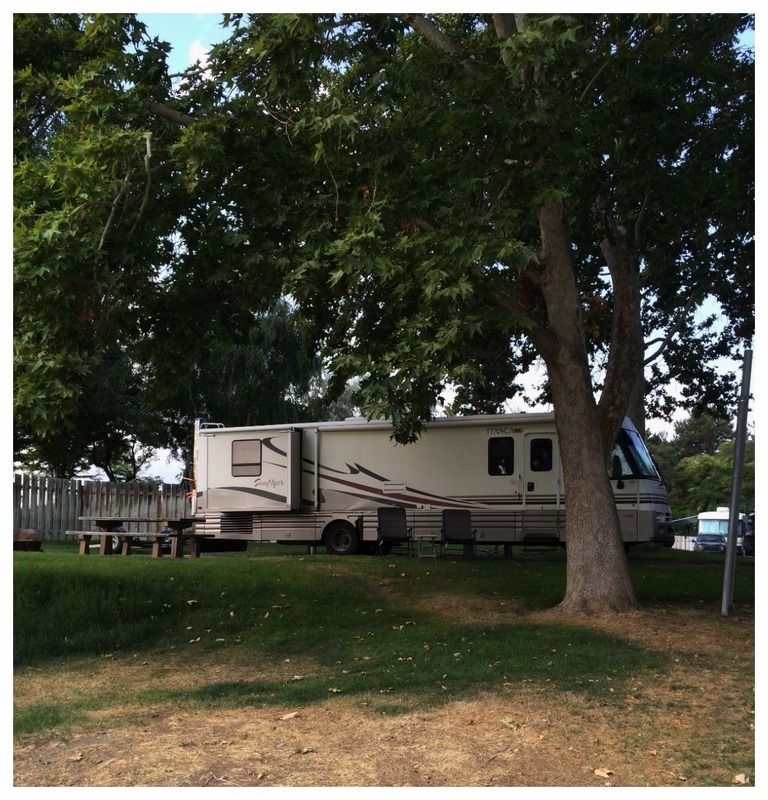 The park is a combination mobile home and RV Park. The lots are short so we had to park the car in the overflow parking a few sites away. 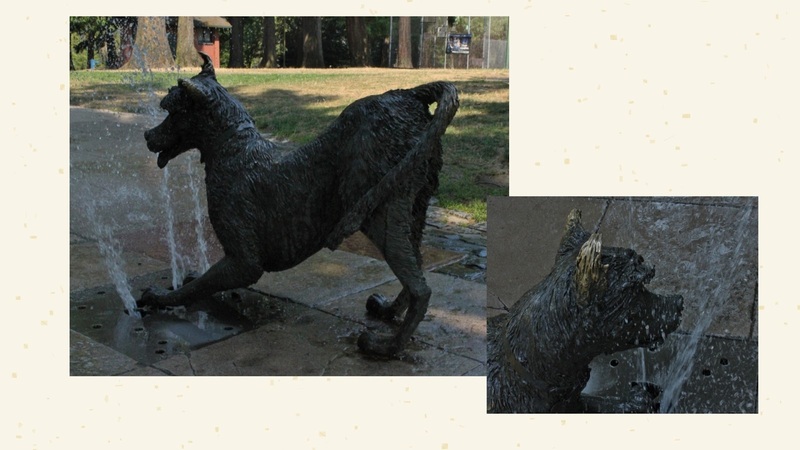 They are about average width with grass and a picnic table.The park is well maintained with a pool area. The laundry and restrooms were clean. The park itself is quiet but the surrounding area is not. There is traffic noise and it is also it in the take-off flight path for Portland International Airport, so the planes are very loud, add the train and freighter horns and you have a lot of noise. The WiFi was good and our Verizon signal was okay. We paid $28.43 a night with our Good Sam Discount. The island is very crowded and there is only one way on and off - onto I-5 north or south and traffic can be a nightmare. One night it took us over an hour to go 1.7 miles to get onto the island. The last time we were in this area in December of 2015, we missed getting the Peter "Wolf" Toth Indians. There used to be two, one in Astoria and the other in Hillsboro, which unfortunately was destroyed in a storm last spring. The Indian in Astoria is the 57th on the "Trail of Whispering Giants" and was carved in 1987 from a Cedar tree. He stands 18-feet tall and is named Iakla Nawan. 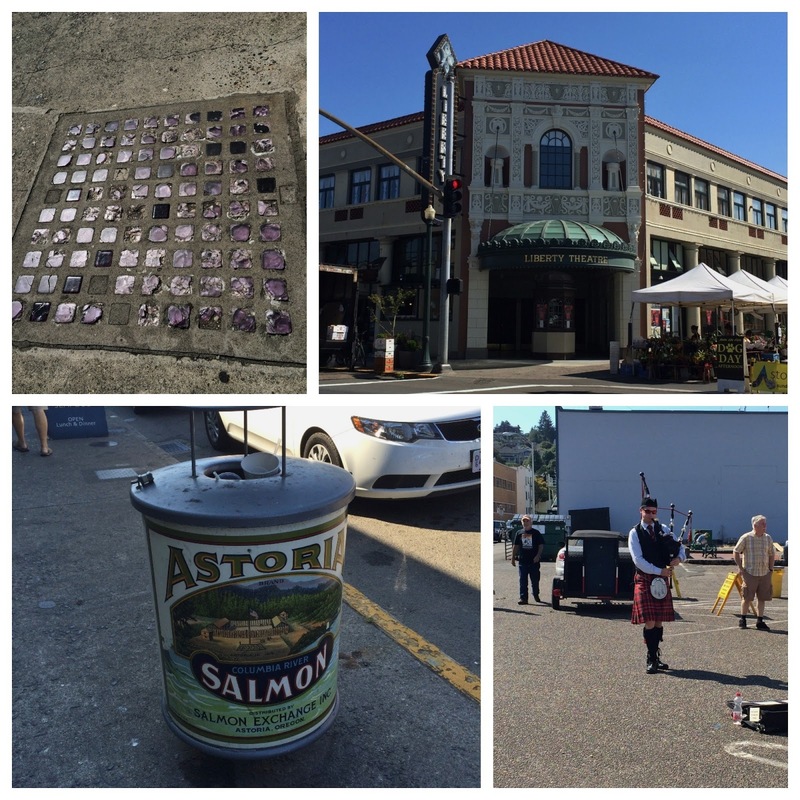 Astoria is a cute little town, lots of antique stores, shops, restaurants and breweries. We lucked out as a street fair was going on while we were there and we got to listen to a bagpiper. The sidewalks have large squares with colored glass in them every 20 feet or so. There are some really pretty buildings and the trashcans are made to look like cans of salmon. We took a break at the Reach Break Brewing, dog friendly and good beer. 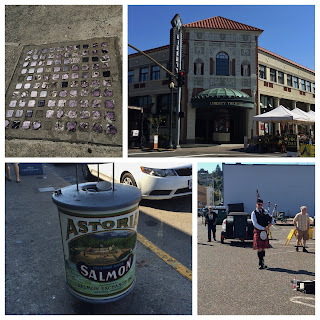 Astoria is also where the movie "Goonies" was filmed but we couldn't find any thing noting that. There were a number of Roadsides. In Scappose we found the "Peace Candle". It was built in 1971 outside what was at the time a candle factory that later burned down, oh the irony. 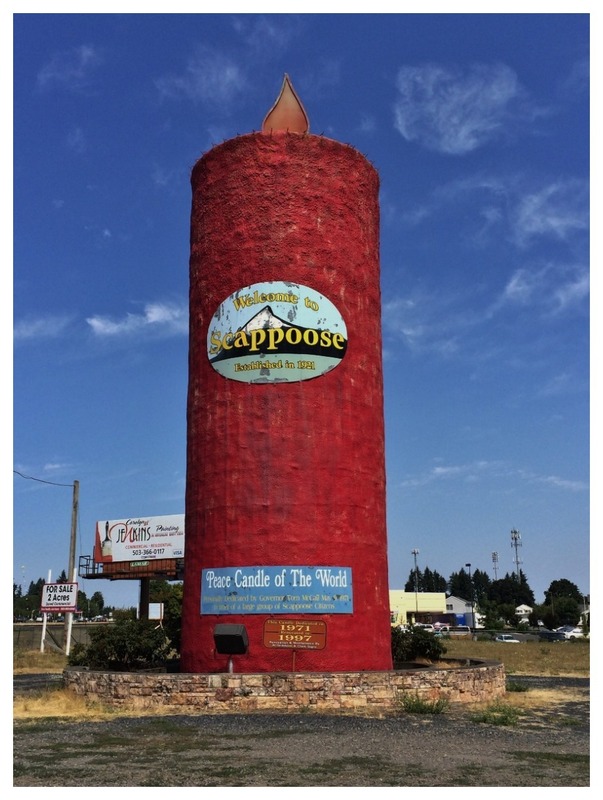 It is a 50-foot silo covered in 45,000 pounds of wax. 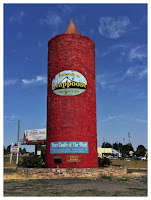 It originally had a real wick but they couldn't keep it lit, so a gas line was run up the center of the silo, but the cost of gas was prohibitive so it now has a neon wick on top! In Hillsboro, where the Peter "Wolf" Toth Indian used to stand is a large metal Mandala with historic carvings from the area, including the Indian. We found a few in Portland. 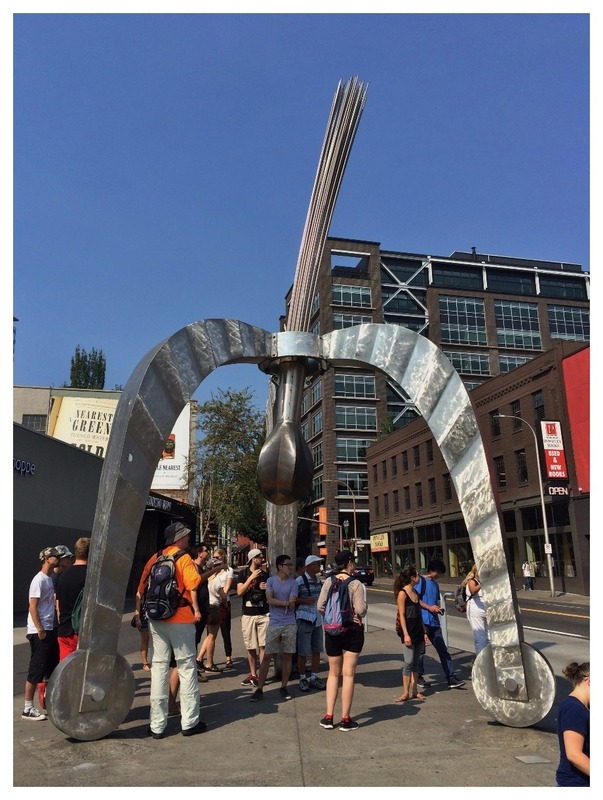 The Pod is a large three legged sculpture with a swinging "pod". It was impossible to get close to it and free of people around it, but still cool to see. 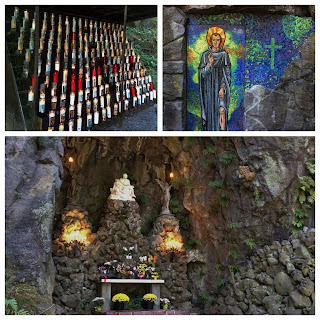 The Grotto is not the quirky thing we usually find, but the Roadside Oddities website is where we found out about it. 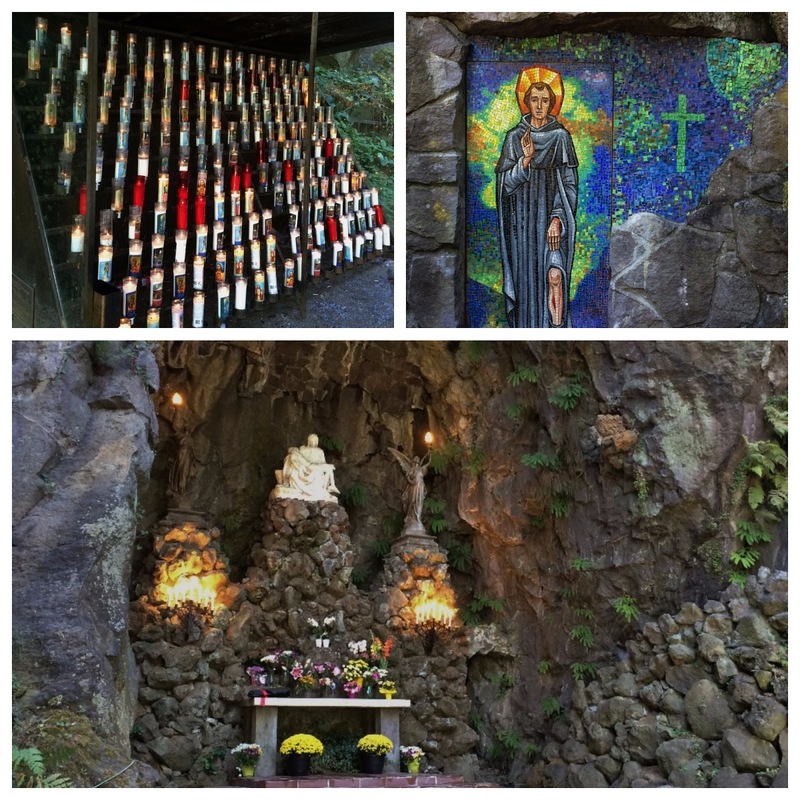 The story of the grotto actually begins back at the end of the 19th Century. A young boy from Kitchener, ON, Canada fearing for his mother's life and that of his newborn sister prayed that if they were spared he would one day create a great work for the church. 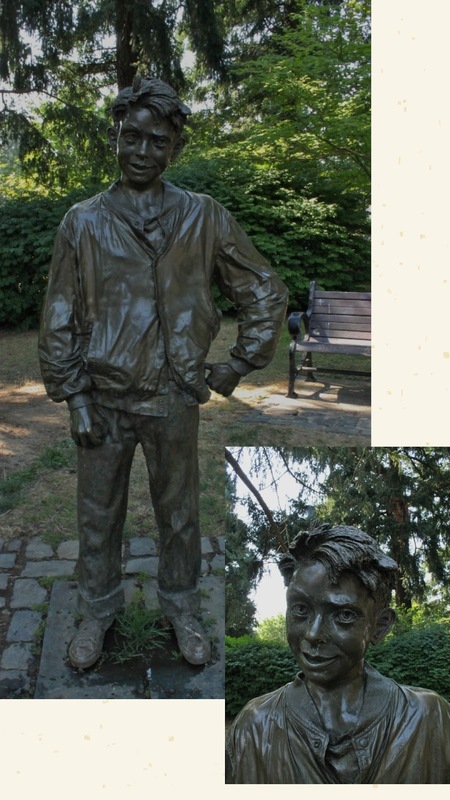 Jump forward to 1918, he was now Father Ambrose Mayer and the first Servite Pastor in Portland, OR. He found this property and raised funds to purchase it and develop the Shrine. Work began in September 1923 and on May 29, 1924 the Sanctuary of Our Sorrowful Mother was dedicated. It has grown over the years with two levels of gardens. We only explored the lower level as dogs are not allowed on the upper level. It is a beautiful and peaceful place. Jamison Square is a wonderful oasis in the middle of the city. It has a stepped fountain that many people were enjoying on this hot day. 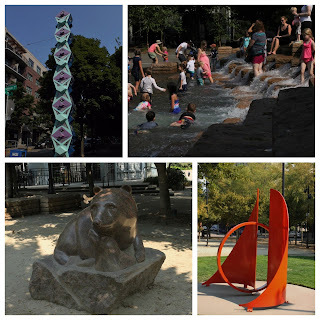 There is a large grassy area, lots of picnic tables and benches and art sculptures. Always so nice to find these places in large bustling cities. Beverly Clearly fans also have a place to go. 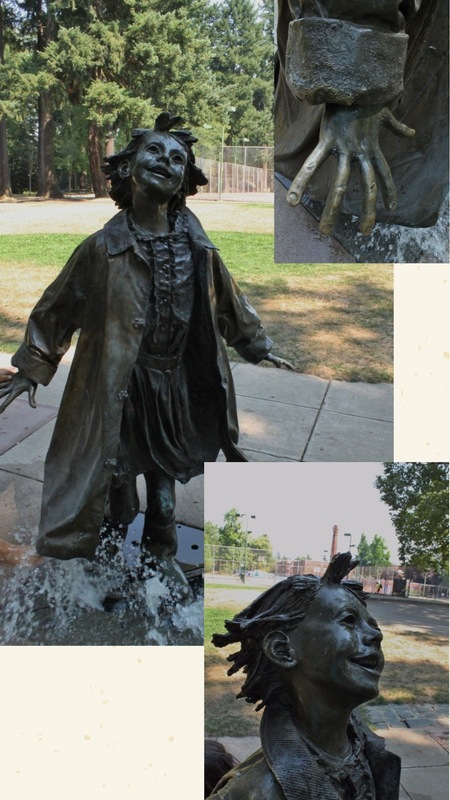 In Grant Park, there are sculptures of Ramona, Henry and Ribsy the dog, beloved characters from her Ramona books. They are in a small water park and the day we were there children were having a blast playing around them and one even having a conversation with Ribsy. 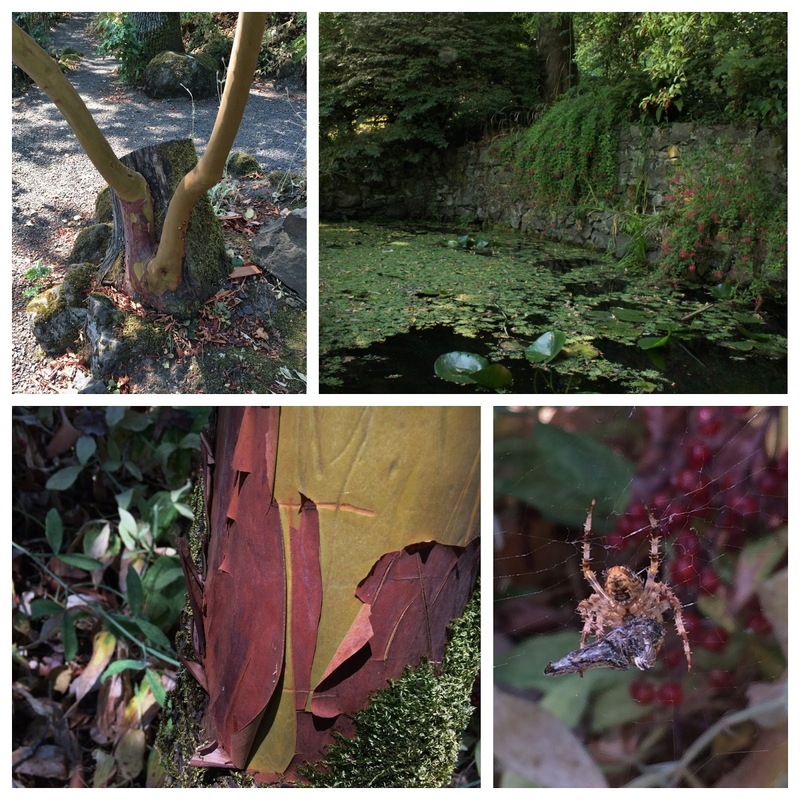 The Elk Rock Gardens, also know as the Gardens at Bishop Close was started by Peter Kerr, a Scott who came to Portland in 1888. He purchased 13 acres of land in the early 1890's and built a large home for his family in 1914. 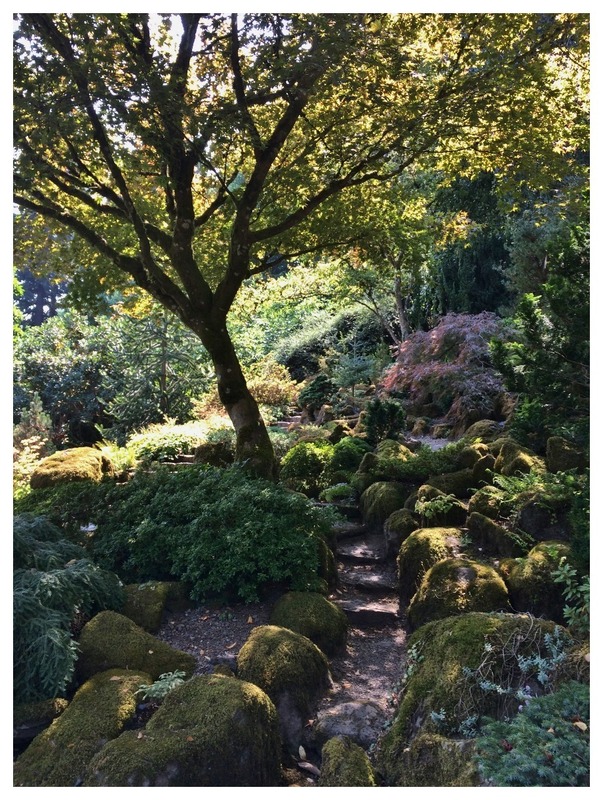 He loved gardening and over the years created this wonderful place. 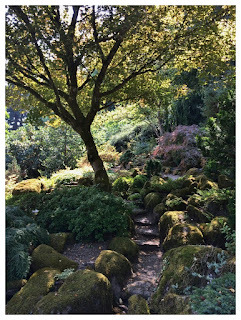 After he passed away in 1957 at the age of 95, his two daughters gave the house and gardens to the Episcopal Bishop of Oregon along with an endowment for upkeep, with the stipulation that the gardens be open to the public. 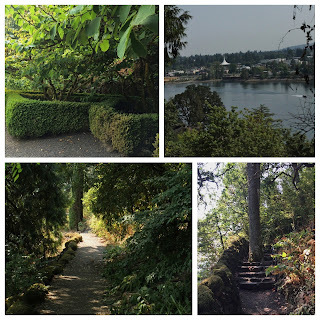 There are a number of paths that twist and turn, some that overlook the Willamette River. We spent two days enjoying waterfalls. There are a number just a short drive from Portland heading east on I-84. Most can be see seen from the road, or with just a short walk to the overlook. 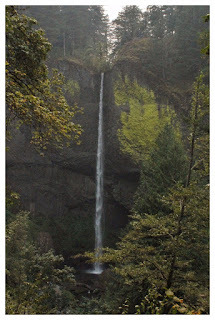 Bridal Veil Falls was first up. 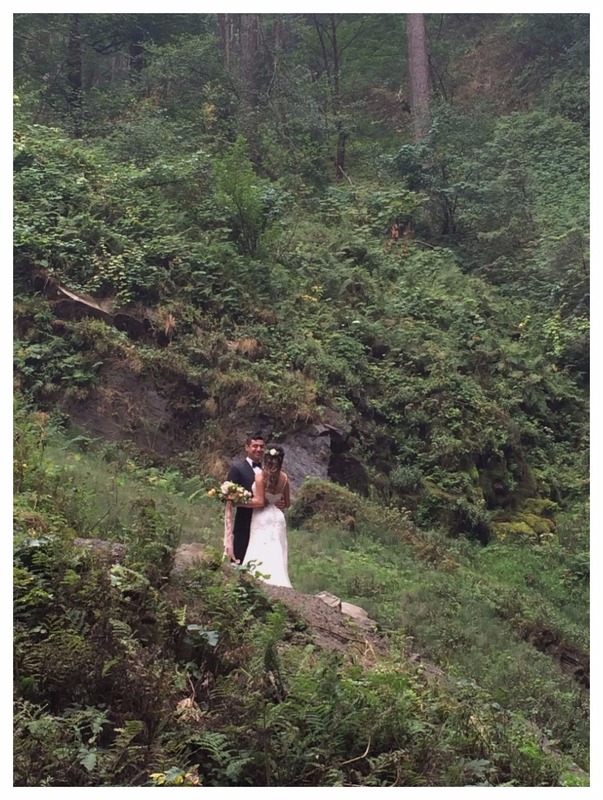 This one requires a short hike, about a mile round trip on a steep dirt path and of course stairs. 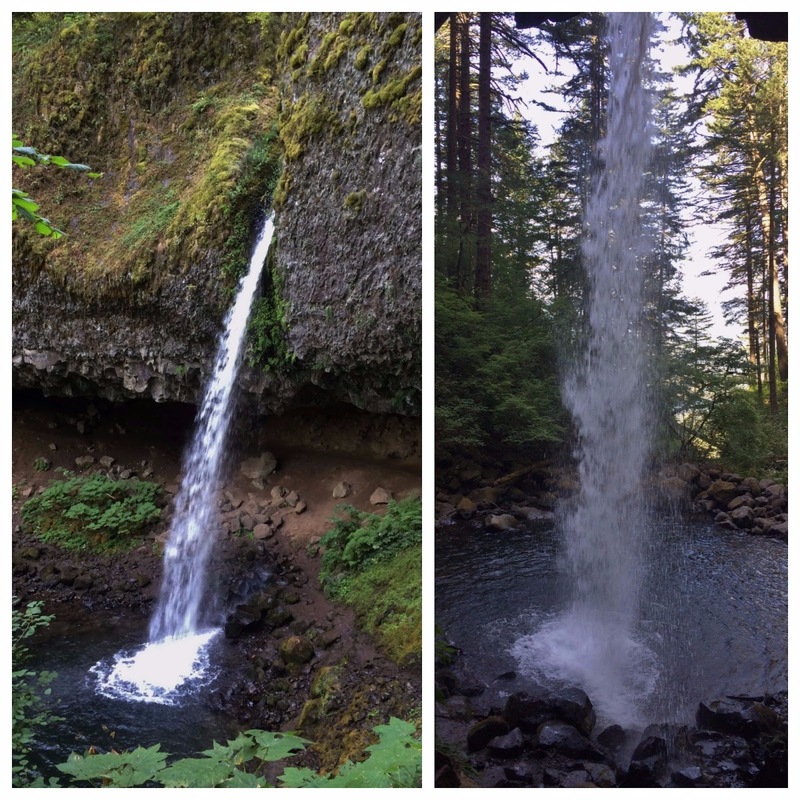 The hike was fairly easy and definitely worth it, the 120-foot falls are just gorgeous. 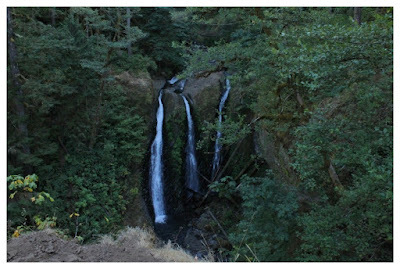 As you cross the bridge over the creek you start getting glimpses of the falls through the trees. Once you reach the overlook you can see the entire falls. 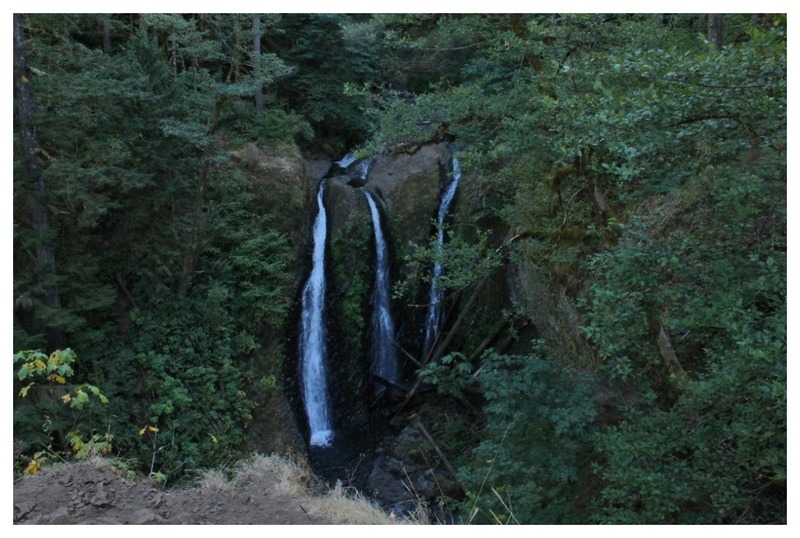 It is actually a two tier falls with a pool in between them. Next up was Latourell Falls just down the road from Bridal Veil. 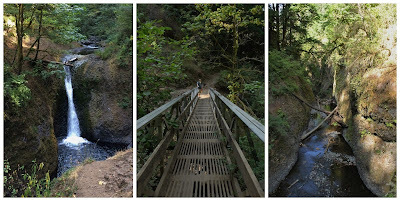 A short walk up a steep dirt path takes you to the overlook and another one takes you to the base of the falls. 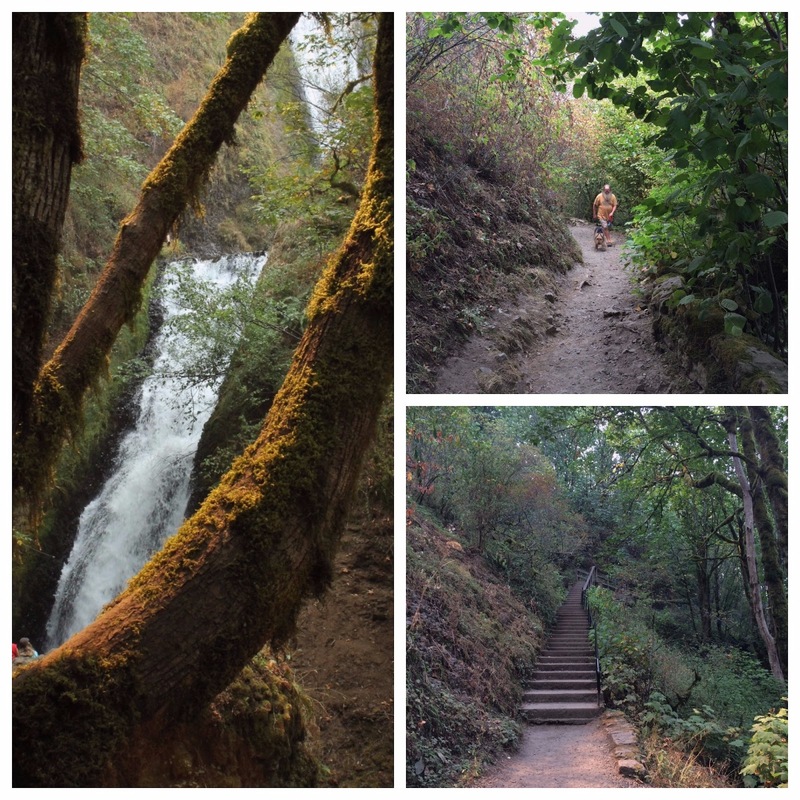 There is also a 2-mile loop trail that takes you from the base of the falls to the top and back down. 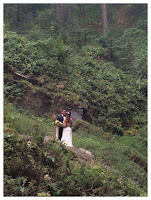 While we were there a bride and groom were having their pictures taken, what a beautiful spot for a photo shoot. Nancy had great fun playing in the water to get her pictures. The power of the water always leaves her awestruck. 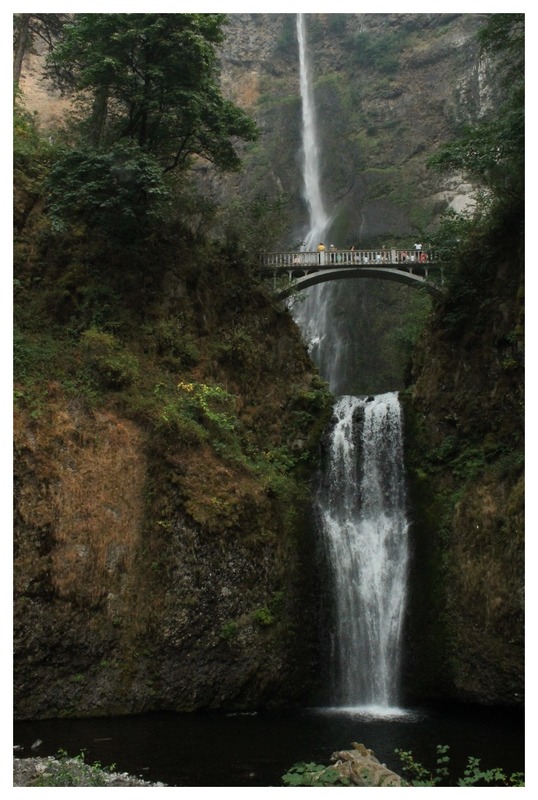 About 15 minutes down the road is Multnomah Falls. 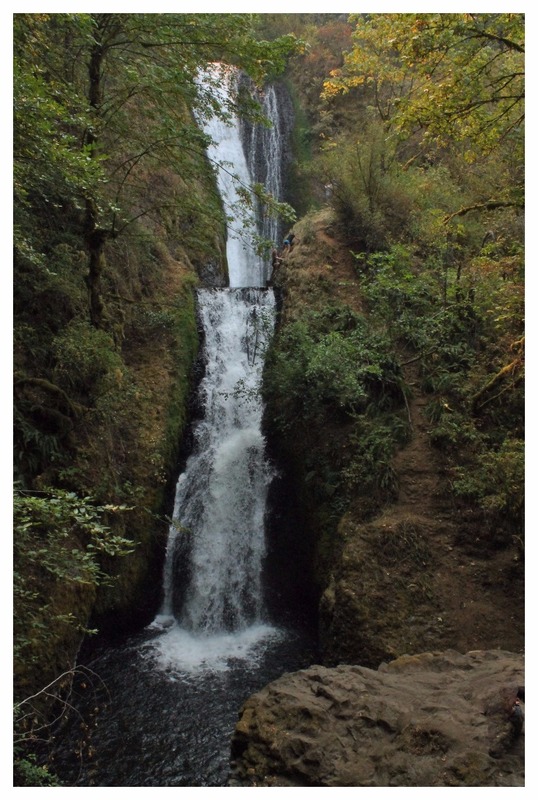 This is probably the most popular falls in the area and at 620-feet it is the tallest falls in Oregon. 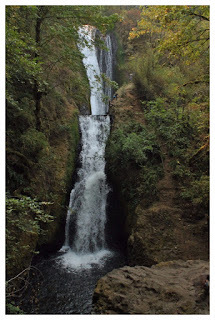 It is also a two-tiered falls. The Lodge at the base of the falls was built in 1925, as part of the agreement made with the state when the land was donated by the railroad company. It is just a day lodge with a restaurant, gift shop and snack bar. 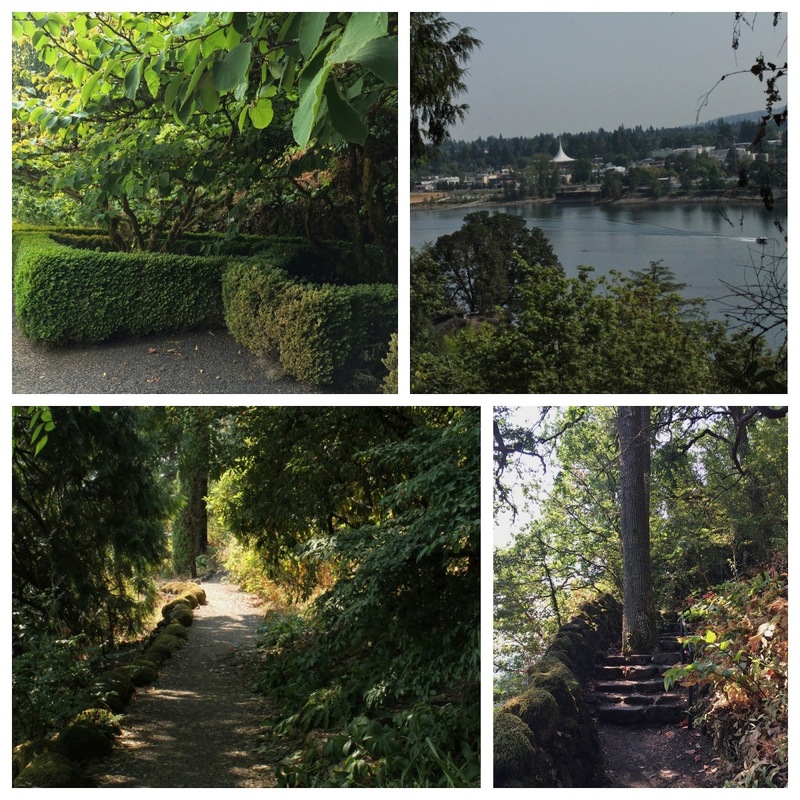 A paved path takes you to a bridge that overlooks the falls and river. 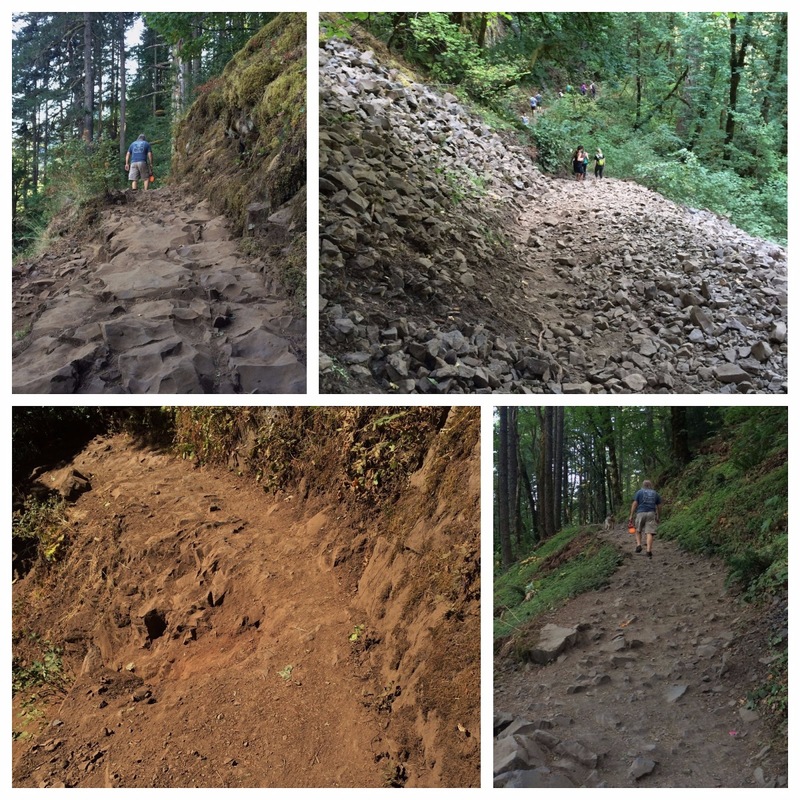 You can continue from there up a steep dirt path with many switchbacks to the top of the falls. 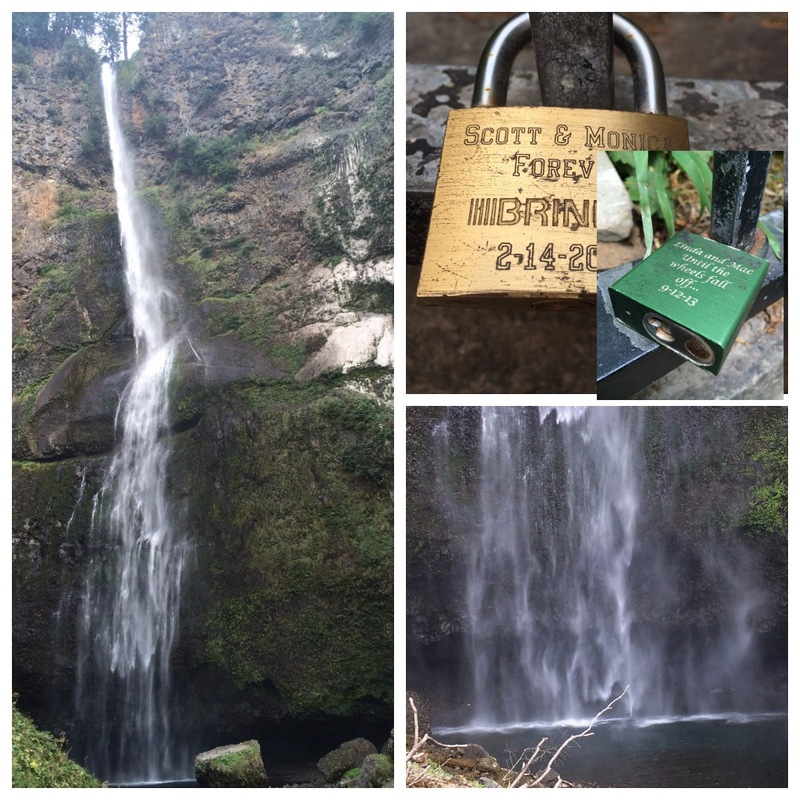 We found two love locks here and both of them were engraved with the couples names. 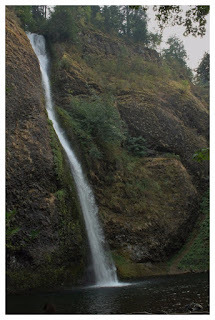 Horsetail Falls, about a 5-minute drive was our last one for this day. It is also right on the roadside with parking across the street. You can take a few stairs down to the waters edge where there are plenty of logs and large boulders to rest on while enjoying the mist from the falls. Nancy ventured out into the very cold water for a few of the shots. The 176-foot drop squeezes through the rounded rock face. There was a wildfire somewhere in the area and the smoke was pretty heavy as we drove about 10-miles farther east to the Bridges of the Gods to cross over into Washington for our drive home. Our second day of waterfalls, started off with what we thought would be a 2.5-mile hike on the Horsetail Falls Trail. 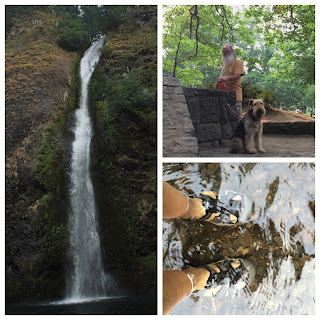 Well, that turned into a 6-mile hike when we decided to add on the trail to the Triple Falls. 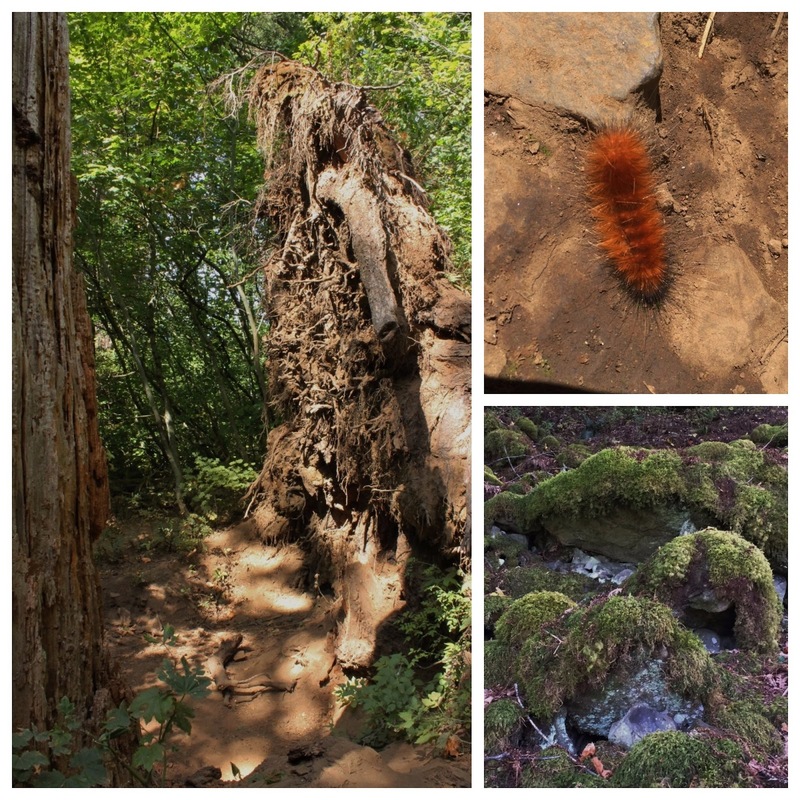 The trail is listed as easy but we are not so sure we would agree with that assessment. 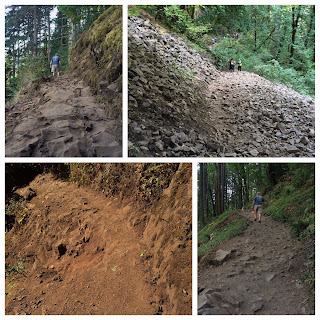 There is an elevation climb of only 610-feet but it is pretty steep. 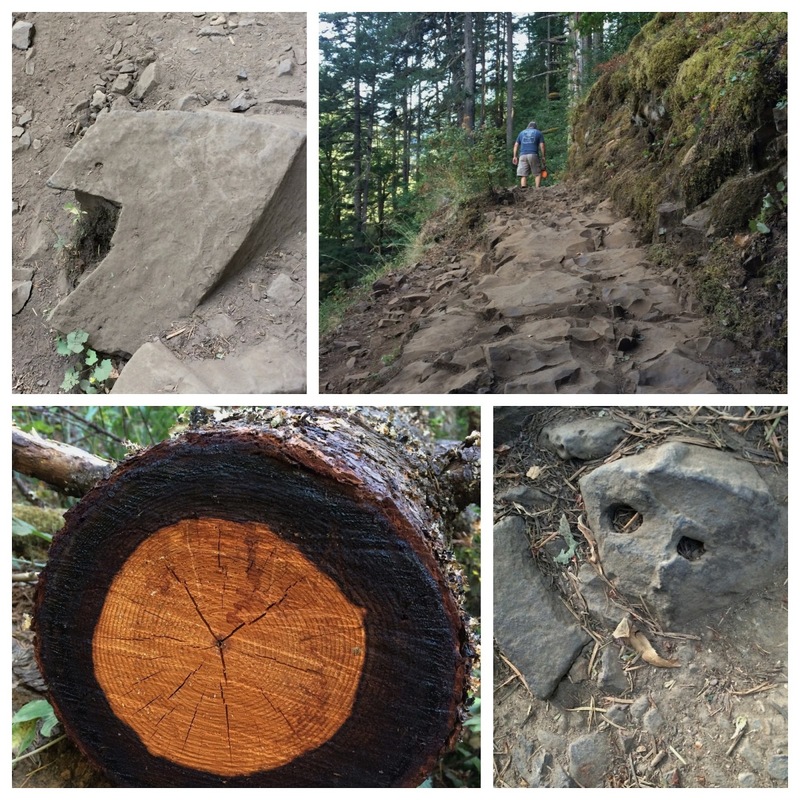 The path is very rocky and some of it is covered in a rock slide. 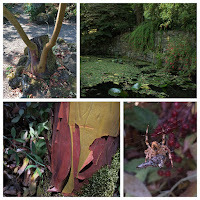 We did find some interesting things along the way and we stopped and rested a lot. 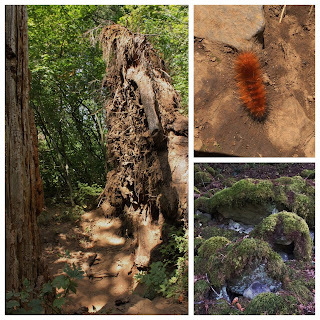 Funny shaped rocks, colorful tree trunks, giant tree roots and the large hole it left in the ground, a fuzzy orange caterpillar and sections of weeping walls and gorgeous moss. 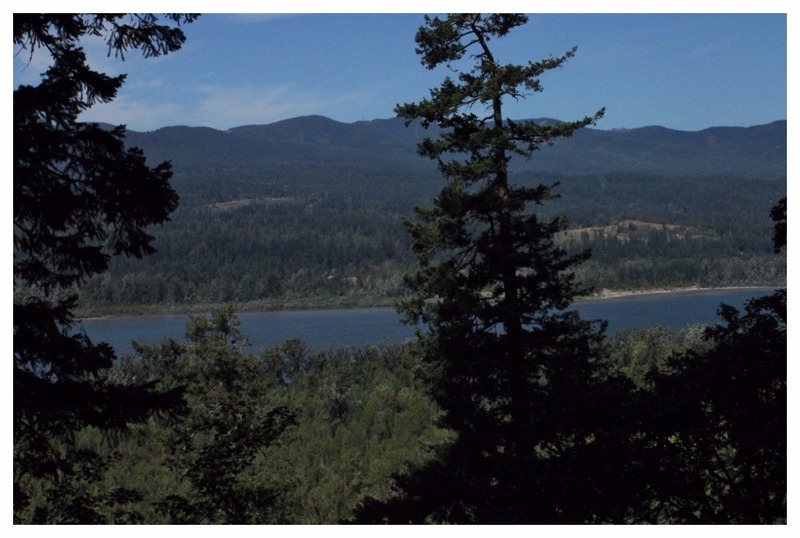 Portions of the trail allowed views of the Columbia River. The skies were much clearer today. As you progress along the trail you leave the highway noise behind and step into another world as you follow the small valley that takes you to the Ponytail Falls. The trail takes you behind the falls which is always fun. 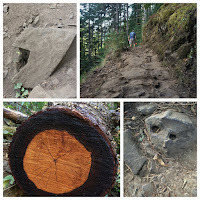 After a number of steep switchbacks the trail connects to a metal bridge. From one side of the bridge you can see the Middle Oneonta Falls. 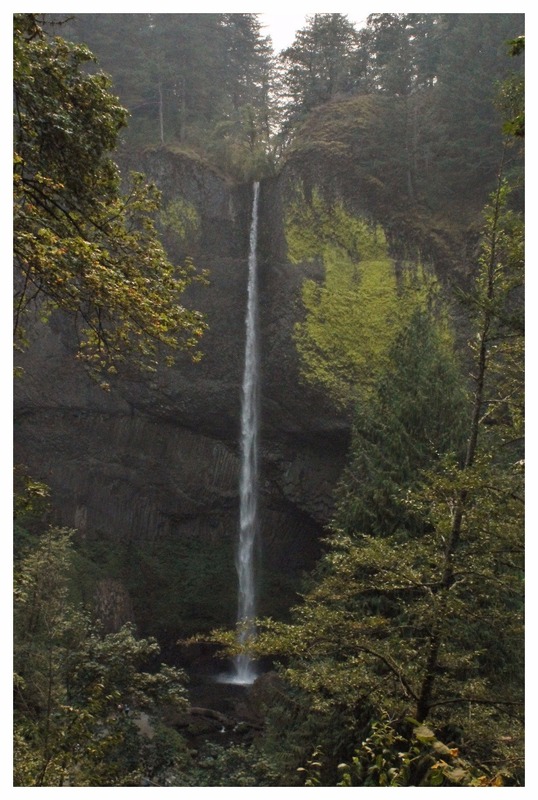 Turn around and you watch the creek cut through a narrow passage where it tumbles down the Lower Oneonta Falls that are just out of sight. From this point it would have been less than a mile back to the car, but we couldn't pass up the opportunity to see another falls. Even though the hike was very strenuous, and there were a couple of times Nancy didn't think she would make it, we are so glad we did. 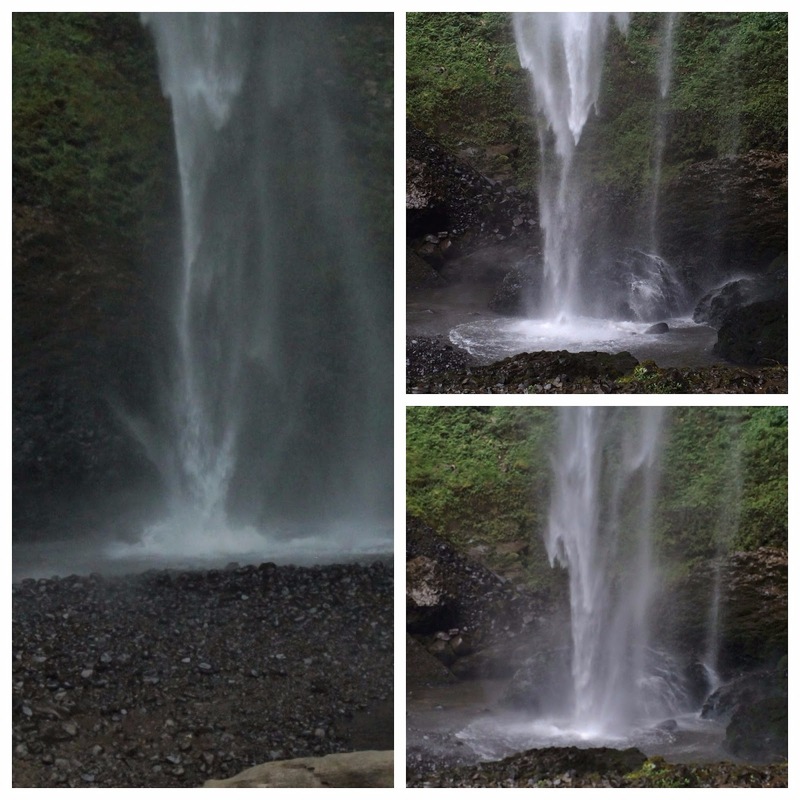 The Triple Falls are like none we have see before. There are three separate sections of rock that the water flows through. Each section forms its own pool and they are all on different levels. Our vantage point was from across the river where we watched kids climb along the rocks and jump from one to the other. Oh to be young and foolish again! The path does go on farther but we stopped here and rested before heading back out. Once again another stop with lots to do and beautiful spots to explore. Of course we had to visit VooDoo Doughnuts. 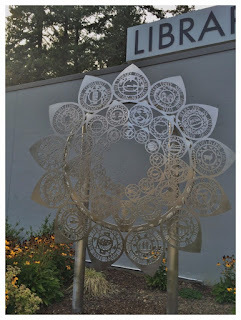 Our last stop was in Gig Harbor, WA. We pulled into the Gig Harbor RV Resort on September 1, 2017. We were lucky to find an open spot as it was Labor Day weekend. We were in site 132, with only water and electric hookups. It is a pull through and plenty long enough but very narrow as are all the sites. We paid $43.76 per night with a senior discount. This put us less than 20-minutes from David John and Rebecca's house, our nephew and his wife. old and Sue our sister-in-law. They are going to be storing our RV and taking care of Mielikki for us while we are in Alaska. This was a good trial run for the dogs and they got along famously. Next up, the great Alaskan adventure! ~ Sometimes you just have to be creative. We drive with all our windows open so we don't have to use the AC - helps save on gas a little bit. Plus with the windows open the entire RV stays cooler. 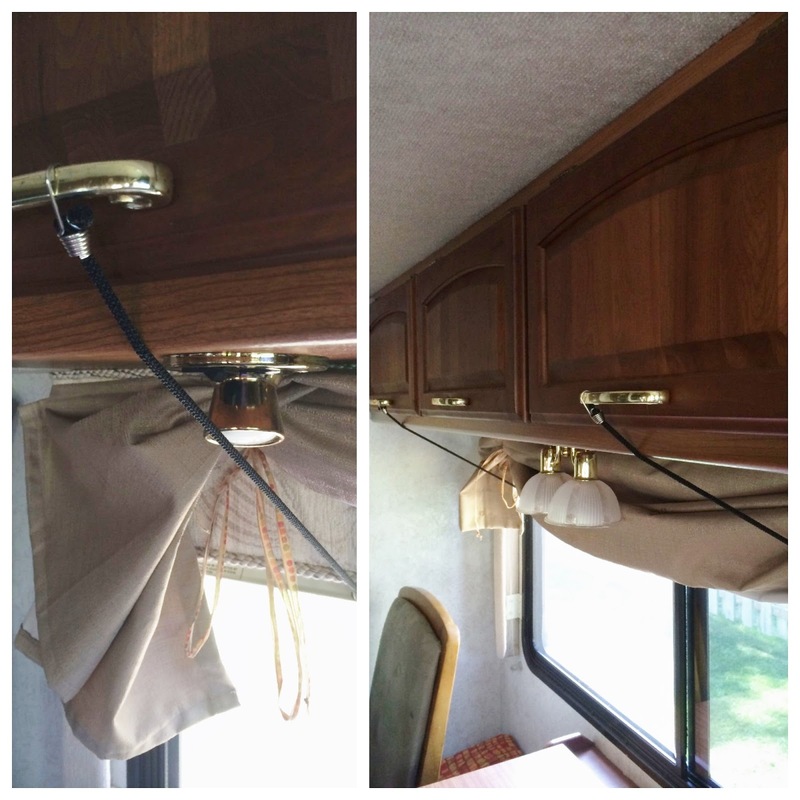 We ran into a small problem recently when our blinds decided that they no longer wanted to stay up while the RV was moving. 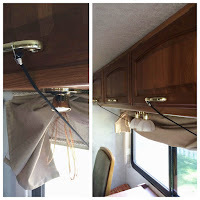 It's really not good for the retractable blinds to be blowing in the wind so our solution is short bungee cords. We hook one end to the handles of the cupboards above the windows and the other to the metal bar on the bottom of the blinds. They stay put and the air can flow free. Road trips are the best - which is why our whole is one big trip! Keep on exploring! !